Megan Roegner wrote this post as a final project for Stacy Krueger-Hadfield’s Science Communication course at the University of Alabama at Birmingham. Megan spent her early years in Cape Town, South Africa playing in the tidal pools along the coast and developing a fascination for marine invertebrates. 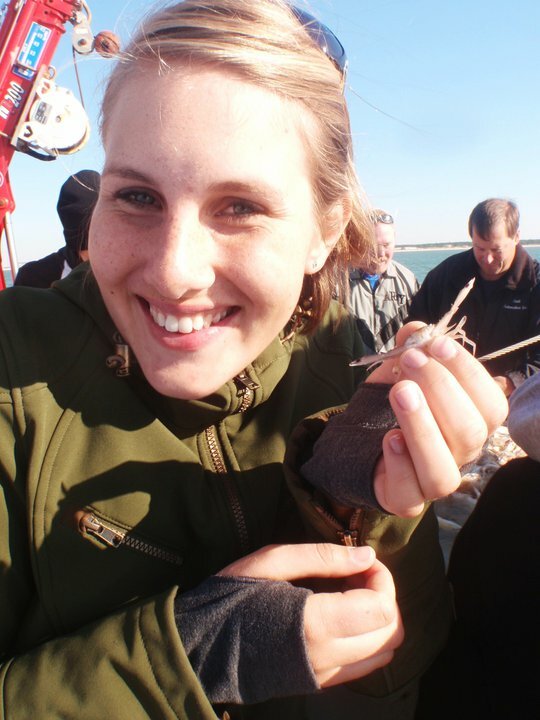 After moving to the United States, Megan attended UAB and is currently working on her PhD in the endocrinology of blue crabs. She hopes to spend her career working to preserve natural habitats and populations of marine invertebrates through better understanding of their interactions with their environments. During molting season, blue crabs shed their hard outer shells, and, for less than a day, they are left with only a soft shell and a limp body. When hauled in by fisherman, they are immediately sold to eager foodies and restaurants alike. With its outer shell so soft, the crab can be eaten in its entirety, with no complicated tools to claw your way to the meat. 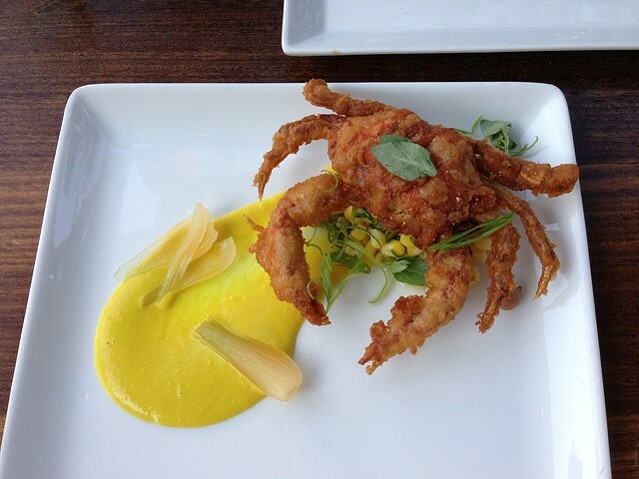 Soft-shell crab is so well loved that demand is constantly increasing, and, unsurprisingly, supply is dwindling. Overfishing has led to the collapse of many fisheries and a serious reduction in natural populations. But, could there be better ways to control molting? Can we figure out what’s going on at the molecular level? Researchers are trying to better understand how the crabs’ environment controls growth and molting. Understanding molting can lead to successful farming of blue crabs that could produce on-demand soft-shell crab. However, crustacean aquaculture has a myriad of problems to overcome: disease, overcrowding, and optimizing conditions. 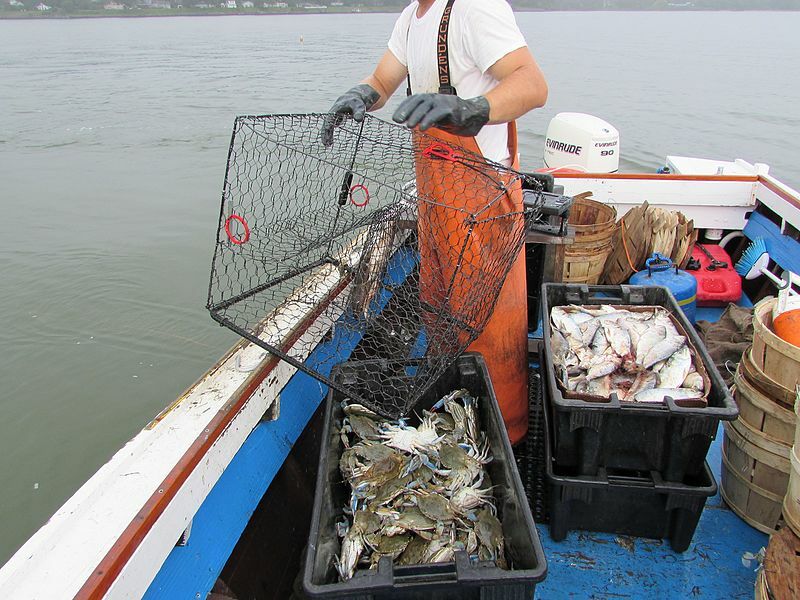 Even if all these problems were solved, it would still be difficult to produce on demand soft-shell crab, as the crab must be removed from the water immediately after molting. To be possible on a large scale, the molting cycle of the blue crab would need to be fully understood and tightly controlled. Here is where the situation gets tricky. In order to regulate molting we must know the molecular mechanisms that underlie it. The molting cycle is a remarkable complex endocrine cascade with multiple feedback mechanisms. Yet, the more we learn about it, the more complex it becomes. Currently, we know that molting is triggered by steroid hormones called ecdysteroids that are produced in paired small endocrine glands just below the eyestalks of the crab (Echalier, 1954). Between molts, ecdysteroid levels are kept low by the action of a peptide molt-inhibiting hormone (MIH) produced in a gland termed the X-organ, found in the eyestalks themselves. At this point the story seems relatively straightforward: an external stimulus, such as temperature or light cycle, causes a decrease in MIH. This, in turn, allows ecdysteroid levels to increase, and the crab enters the molt cycle. If you could control the external stimuli, you could cause molting at will. But, like all things molecular, it’s not this simple. Several studies have shown that an intracellular calcium (Ca2+) signal may be involved (Chen et al., 2012; Mattson and Spaziani, 1986). But, where’s this Ca2+ signal coming from? Is it simply the result of a reduction in MIH, or is another stimulus involved? Though we’re trying to understand the function of the Ca2+ signal in the molt cycle, nothing has addressed the origin of the signal itself. As the old exoskeleton breaks down, the hemolymph (or blood equivalent) of the crab is flooded with Ca2+. It’s possible that the Y-organs detect the increased levels of Ca2+ and that the external Ca2+ increase could cause an internal signaling cascade ultimately leading to increased production of molting hormones. If this is the case it begs the questions, how does altering the outside environment affect molting and growth? This question has applications beyond the aquaculture industry. How will crabs respond to fluctuating environments? Ocean acidification leads to a decrease in ocean pH and a subsequent decrease in CaCO3, the primary source of Ca2+ and carbon for re-calcifying of the crustacean shell. How would a decrease in Ca2+ levels in the ocean water affect the crabs molting cycles? It is expected that less Ca2+ in the ocean water would make it harder for the blue crab to build its new shell, leaving it weak and exposed. Yet, Ries et al. (2009) found that crabs, and several other crustaceans, actually build larger shells under lower pH conditions. This caused quite a scare. Can the crabs fill out their new shells and be super-sized? The larger shell may let the crab be a more effective predator for its favorite food, the oyster. Oysters are themselves suffering from the effects of ocean acidification and may produce weaker shells that are more easily consumed. Increased predation from ‘super’ crabs would be another assault on native oysters. While the idea of super crabs is a nerve wracking one, there are other ways this increase in shell size could affect the crab. While the shells may grow larger, and the increases in Ca2+ released from breaking them down could cause faster molting. The body of the crab may not be able to keep up. Instead of a super crab you may have a crab unable to effectively move its own shell, like a little girl trying to walk in her mom’s high heels. This could cause difficulty in foraging for food and reproduction, leading to a decline in crab populations and harder to find soft-shell crabs. While we do not yet know how these environmental changes will affect the internal Ca2+ of the crab, it may fundamentally alter crab physiology. Due to crab larvae developing out in the ocean waters, and being transported by the ocean currents, there is a high level of gene flow between blue crab populations (Lacerda et al., 2016). This means that an environmental pressure, either man made or natural, placed on one population can affect blue crabs across a broad geographical range. Understanding of the basic physiology and how it applies to the environment around the crab is vital to preserving natural blue crab populations, make sure we don’t lose valuable food sources such, and ensure the recovery of natural systems, like oyster reefs. Chen, H.Y., Dillaman, R.M., Roer, R.D., and Watson, R.D. (2012). Stage-specific changes in calcium concentration in crustacean (Callinectes sapidus) Y-organs during a natural molting cycle, and their relation to the hemolymphatic ecdysteroid titer. Comparative biochemistry and physiology. Part A, Molecular & integrative physiology 163, 170-173. Echalier, G. (1954). [Experimental studies on the role of so-called organ Y in Carcinus meonas L., the decapode crustacean]. Comptes rendus hebdomadaires des seances de l’Academie des sciences 238, 523-525. Lacerda, A.L., Kersanach, R., Cortinhas, M.C., Prata, P.F., Dumont, L.F., Proietti, M.C., Maggioni, R., and D’Incao, F. (2016). High Connectivity among Blue Crab (Callinectes sapidus) Populations in the Western South Atlantic. PloS one 11, e0153124. Mattson, M.P., and Spaziani, E. (1986). Regulation of crab Y-organ steroidogenesis in vitro: evidence that ecdysteroid production increases through activation of cAMP-phosphodiesterase by calcium-calmodulin. Molecular and cellular endocrinology 48, 135-151. Ries, J.B., Cohen, A.L., and McCorkle, D.C. (2009). Marine calcifiers exhibit mixed responses to CO2-induced ocean acidification. Geology 37, 1131-1134. This entry was posted in bioinformatics, blogging, conservation, domestication, evolution, genomics, natural history and tagged Aquaculture, Blue Crab, Endocrinology, Physiology, scicomm, Science Communication. Bookmark the permalink.